A conversation with actor, producer, co-writer Anjul Nigam on the newly released film. Last weekend, a newly released film created tremendous buzz. This is a film that will make you laugh, make you cry, and make you nostalgic, taking you back to that time when you first fell in love. For many of us, who are immigrants or have parents that are immigrants, this film will touch you and establish that bond which we all often seek and want to appreciate. 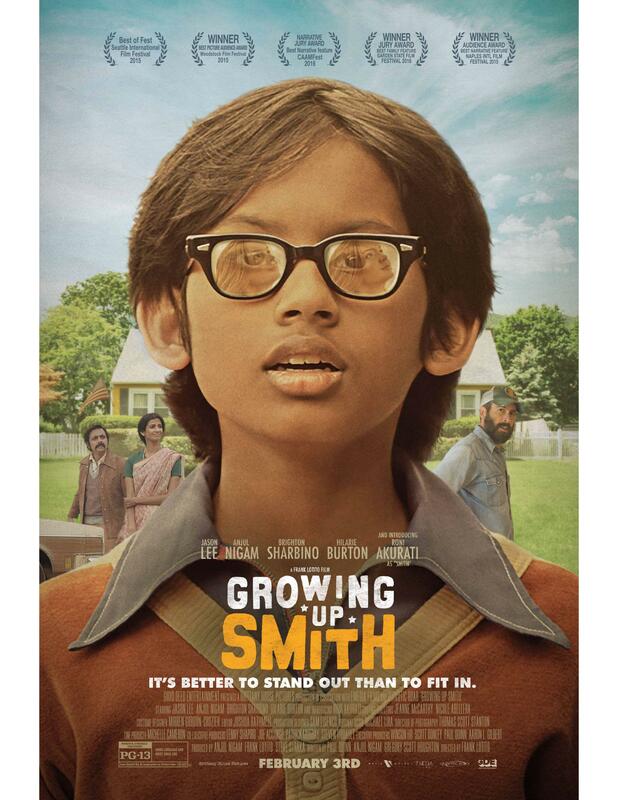 This film is Growing up Smith, directed by Frank Lotito and starring an amazing cast featuring Jason Lee, Anjul Nigam, Poorna Jagannathan, Brighton Sharbino, Hilarie Burton, Shobha Narayan, Samrat Chakrabarti, and the new star in the making, the young Roni Akurati as Smith. The film takes place in the year 1979, when a family from India moves to America with the hope of living the American Dream. While their 10-year-old boy Smith falls head-over-heels for the girl next door, his desire to become a “good old boy” propels him further away from his family’s ideals than ever before. The film is a tribute to childhood heroes, first love and growing up in “Small Town America”… in times that were simpler. 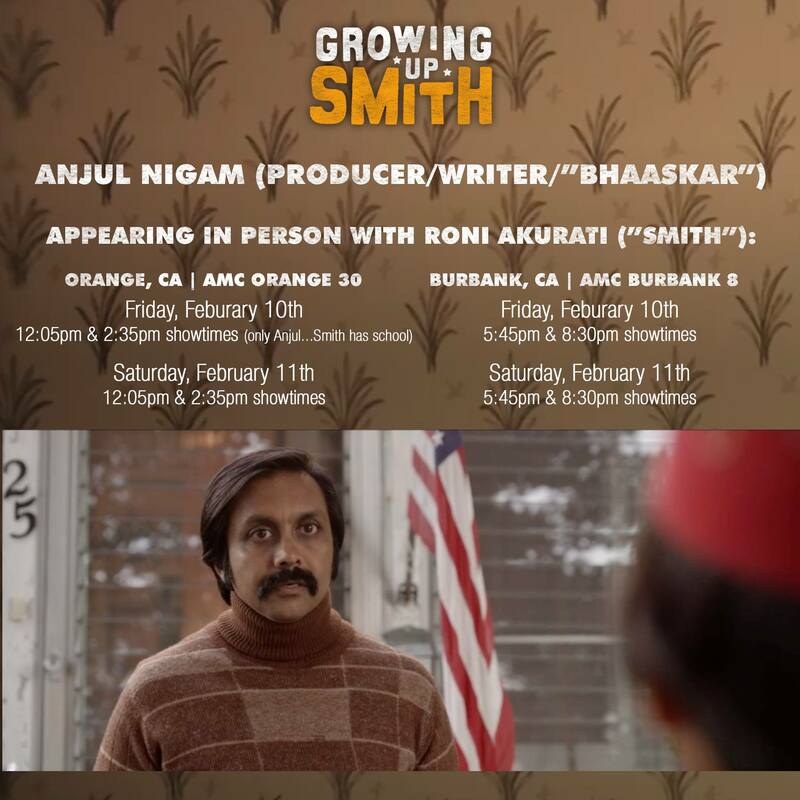 I was fortunate to have both seen the film (whose review can be found here) and have a conversation with the Actor-Producer and co-writer of the film, Anjul Nigam, about the essence of the film, how it was put together, his role as Smith’s father Bhaaskar in the film, and how this has really been a labor of love. The last I had met Anjul Nigam, prior to this conversation, was back in 2009. I remember him telling me about a project that he was co-writing and gearing up to produce, entitled Good Ol’ Boy. Interestingly, that very project that we discussed almost 10 years ago is in fact Growing up Smith. I asked Nigam about how his journey has been with this project and what has kept him excited about this feature over the past decade – from getting the script finalized, pre-production, filming and now to release. “The journey began back in early 2000, and it has taken us over 10 years to get this project made,” says Nigam. Nigam explained that the journey for this project began way back in the year 2000 when a writer by the name of Gregory Scott Houghton wrote a script called Good Ol’ Boy. Houghton was inspired by the story of his roommate, whom shared with Houghton his past growing up in a small town in the US in the 1970s. After writing the script, Houghton contacted Nigam, whose acting work he was familiar with, to play the role of the leading character Smith’s father Bhaaskar Bhatnagar. Nigam came on board and was thoroughly attracted to the core of the story – about an Indian family that leaves India to come to the States in 1979 and who has a 10 year old boy that falls for the girl next door. “The parents are very traditional with an authoritative dad who always threatens to send the son back to India. It is a culture clash story,” says Nigam. Over the next year, Nigam spent some time rewriting the script, and also brought on board writer-producer-director Paul Quinn whose film This is My Father, impressed Nigam. The story resonated with Quinn, as he remembered growing up with Irish immigrant parents who were so concerned about their son becoming too westernized, that they sent their oldest child back to Ireland because they felt he was becoming too out of control. Quinn was all set to direct the venture and wheels were put into motion for the project. Subsequently, as the project team began the journey of putting the package together, there were roadblocks that came in the way, namely facing some potential investors whom turned out to be fraudulent. With financing in place, Nigam now had to put together a dynamite cast, particularly with finding a known name to play the character of Butch Brunner, one of the leading roles in the film. Nigam was seeking an actor that could provide a “middle-American resonance” to the part, in addition to being well recognized and exude the characteristic of being a hero to little Smith. For the crucial role of Butch, Nigam found the perfect cast member when the awesome Jason Lee (My Name is Earl, Alvin and the Chipmunks movies) was brought on board. In fact, Nigam said that Jason Lee’s main attraction to the script came from similarities he saw between it and Cinema Paradiso, his favorite film. As the film was gearing up for production, tragedy struck as Paul Quinn was diagnosed with cancer, an illness which would eventually take his life in 2015. I also spoke at length with Nigam about the personal resonance of the film and inquired whether he drew from personal experiences for his role as Bhaaskar Bhatnagar, Smith’s father. Nigam shared the character of Bhaaskar is like his father in many ways in that Indian immigrants traditionally focused on two aspects of their journey – first to find a home away from home, and second to achieve enough success to one day go back to India. Nigam’s father, a former Professor, also carried the same mind set and through the years had continued to talk about going back, says Nigam. One of the most interesting observations Nigam has made is about the dichotomy between the belief system between some Indian immigrant families in the US versus those in India. “We came in ‘67. Our immigrant family was in a pod, where you are doing very religious, cultural things, so you have a castle that you live in, you have parties. My parents held on to certain traditions, but when we would visit India they (friends and family) were becoming more westernized than us. 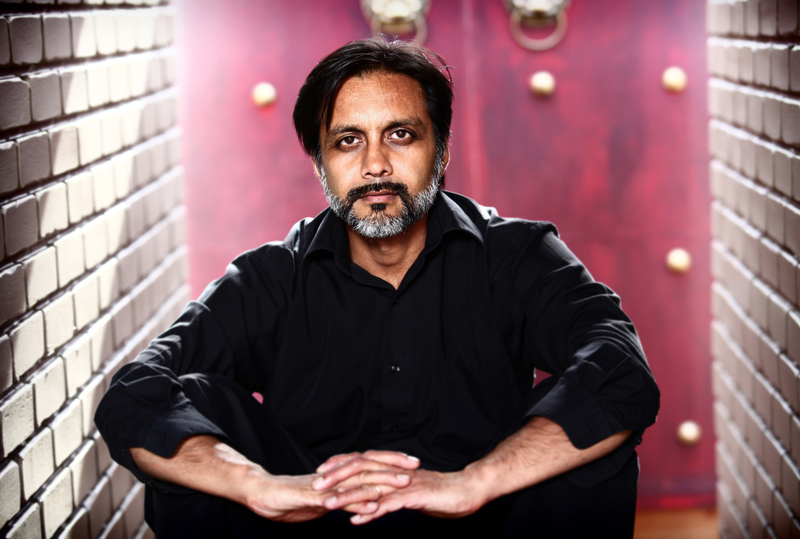 We stay frozen in the time period of the homeland that we left,” Nigam observes. This particular notion is also one of the major themes that the film set out to convey. Given recent concerns in our country about immigration, I asked Nigam whether he felt the film would address any questions currently being raised in the turbulent political climate. Nigam affirms that the film aspires to send a positive message to its viewers. Nigam also adds that with this film there is an opportunity to reach people at an emotional level, with a sense of nostalgia when you look back at your life and experiences. It was truly a wonderful conversation I had with Mr. Anjul Nigam, revealing the essence of the film and the process by which the film came together, wrought with ups and downs, and twists and turns. Ultimately, however, passion prevailed – representing the 3 Ps that Nigam had once mentioned to me the first time we met – patience, persistence, and perseverance. Growing up Smith has already opened to rave reviews and continues to march with its success around the nation. Do book your tickets today and check your local listings for showtimes. Don’t miss this beautiful film!